This book, written by two of our long standing members, and comprehensively updated in 2019, is an indispensable and handy guide to becoming a freelance Sales Agent. There are many employed sales people that contemplate becoming a freelance Sales Agent but, due perhaps to fear of the unknown, do not take the final step towards becoming masters of their own destiny. 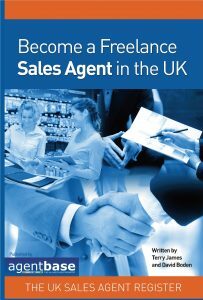 Become A Freelance Sales Agent in the UK is designed to act as a guide and is full of advice on establishing a successful business, and avoiding the pitfalls. It’s not a difficult business to start, you don’t need any qualifications, nor a huge investment, and the rewards can be very high. So go ahead and take the plunge… the UK needs more freelance sales agents. I became a freelance sales agent by accident, having risen to management status in sales and having been through a spate of redundancies, it was a case of ‘the higher you rise the further you fall’. I got fed up with my fate being in the hands of others. In searching for a solution to this problem, my thoughts naturally turned towards self-employment. Having just reared a family my capital was very limited so starting my own company making or leasing out widgets and so forth was out of the question. An evaluation of my skills showed that my main experience lay in my lifetime experience in sales. But how was I to capitalise on these skills without working for someone else? A chance occurrence happened at this point. A previous colleague revealed that his company were seeking a sales agent in my area. As I was unemployed at the time I had nothing to lose by attending the interview. I was most impressed by the company and its products and was offered the agency. Realising that it would take some time to get established, cover my expenses and make a profit, I set myself an extremely tight budget. I arranged a small overdraft with my bank and accepted the agency. As luck would have it I walked into a major order for the product almost immediately and was hooked on becoming a sales agent. That was some fifteen years ago. I wish I could say it has been easy all the way but it has not. There have been good and bad times but that is true of life in general. I am not earning a fortune but I have something I prize above all else, my independence. I am now out of the rat race. I am not judged by whether my face fits into an organization or how I get on with the boss. I am judged by how much I sell. If I don’t sell I don’t eat. It is as simple as that. I could earn considerably more if I worked harder but, approaching retirement age, I am starting to wind down. That is why I wanted to write this book, to pass on some of my experience to anybody who is thinking of becoming a freelance sales agent but is afraid of the unknown.